With the recent change in the weather, we’ve been invaded by ants. They’re coming in through a gap under the molding in an exterior wall and wandering all over. I’d rather they not hang out in the walls and find another way in. Thus, I’ve decided to eradicate them. While I could use a commercial pesticide or buy ant baits, I’ve always taken a much simpler — and less toxic — approach to killing ants. In short, I mix a small amount of boric acid powder (available at Amazon or most local drug stores) with a roughly equal amount of sugar. This isn’t rocket science, so you can eyeball it. Anything close is more than enough to attract and kill ants. Next, you’ll need a small container. I like to use the cap of a milk jug, though something like the lid from a 2 liter bottle would work, too. Fill the lid about halfway with your boric acid/sugar mix and then dribble some water into it and mix with a toothpick to make a thick slurry. If it’s too watery, you can pour off a bit of liquid and/or add some powder to the mix. Now just place one or more of these homemade baits along the foraging path(s) that inevitably develop when ants show up. The closer you can get this to the source the better. But anywhere along a foraging trail should work. And then… Wait. It may take some time for the ants to discover your delicious-but-deadly concoction. But once they do, word will spread and you’ll soon have a ton of ants feeding on your homemade bait. 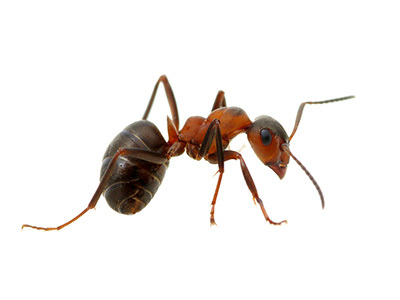 As it turns out, boric acid kills ants, but it doesn’t kill them right away. And the sugar is enough to draw them in for a feast. Thus, they’ll fill their proverbial bellies and then take their deadly treat back to the nest with them. Note: Sugar has always worked great for us, but if you can’t seem to get them interested, try mixing the boric acid with peanut butter. Some ants prefer sweets, others prefer fats and grease — it may even vary seasonally. Keep in mind that it’s important to let the boric acid do the hard work. Thus, you need to resist the temptation to start squashing ants when they show up to feed. If you let them live, they’ll go home and wipe out the entire colony. In my experience, the entire process takes a day or two. Stubborn infestations might take a little longer. Regardless, this approach is astonishingly effective. And yes, having raised four young boys, we’ve had our fair share of ant infestations. Boric acid isn’t particularly toxic to people. In fact, it’s commonly used as an antiseptic for minor cuts and burns or, in low concentrations, as an eye rinse. Still, I would be careful to keep young children and pets away from your baits. Also, I’ve heard that similar approaches are effective for cockroaches, though I don’t have any firsthand experience with that. If you have any other diy pest control tips to share, please don’t hesitate to leave a comment. We used to get ants in the kitchen a couple of times a year. Now, I’ve taken preventative measures including spraying the permiter of the house three times per year. Since I started doing this, we have not had any big ant infestations. This is the first time we’ve had a problem in several years. It used to be more common when the kids were younger and messier but (knock on wood) it doesn’t happen very often nowadays. Thus, I’d rather just treat the problem as it comes up. If you can find their next, pour boiling water down it. A couple times per year, I will get these huge colonies outside overnight and this takes care of them. I’m so happy I live in a building that hasn’t had an ant issue. Years ago, we lived right above the dumpster and one summer were invaded by ants. They were coming in through every vent in our living room and kitchen. It was so gross. Thankfully, the building took care of it and eventually they went away. From then on, I’ve taken precautions in the kitchen to put everything in canisters or tupperware – the ants can’t smell a thing. Interesting tip. I hadn’t heard of anything like this before, but I like the idea of getting at the nest indirectly like that. This approach is almost like “treat the cause (the nest) and not the symptom (the trail of ants).” The tough part would be watching the ants continue to infest everywhere for several days especially if there’s a bunch of them. We haven’t had an ant problem in a few years (it was mice last year instead!! ), but inevitably the ants will come around again. We’ll try this tactic. The good news is that if you put the bait along the foraging trail anywhere near the source, ants on their way in will stop to eat instead of going further. Thus, as foragers return to the nest, the problem quickly subsides and becomes highly localized. And within a day or two after that, they’re completely wiped out. The danger with poisoning mice instead of trapping them is that they may go back into the walls and die — where they’ll rot and stink!!! That’s not a problem with ants, so this strategy works well.